Erick Erickson, The Resurgent: "President Donald Trump has made a very reasonable compromise. He has abandoned his idea of a wall-to-wall border. He has abandoned his claims that Mexico would pay for the wall. And he has offered to embrace Deferred Action for Childhood Arrivals, after previously rejecting it. But the Democrats have refused to compromise on even this. They are being unreasonable. And the media are choosing to ignore it all because they would otherwise have to point out the Democrats are now the ones prolonging the government shutdown by refusing to compromise." Jennifer Rubin, The Washington Post: "Wait, you say. Wasn't he the one who put DACA ... folks at risk, and haven't the federal courts already given DACA beneficiaries a likely one-year reprieve? Well, yes. A burglar has broken into your home, has taken the silver and is now offering to lease it back to you for three years only - but first, give him a $5.7 billion edifice. ... We are in this predicament because Trump has repeated reneged on a deal." Sen. Jeff Merkley, D-Ore., ABC News: "The American people want us to spend money in a smart way. Five billion dollars is a lot of money. ... To spend it on a fourth-century strategy rather than on stuff that actually improves border security is something that we're just not going to do." Judge Jeanine Pirro, Fox News: "Democrats - demon rats - are dug in to the theater of lies and hate, casting Donald Trump as evil while casting themselves as angels, supported by a mainstream media intent on publishing any anti-Trump story, however baseless or absurd. Journalistic standards be damned." 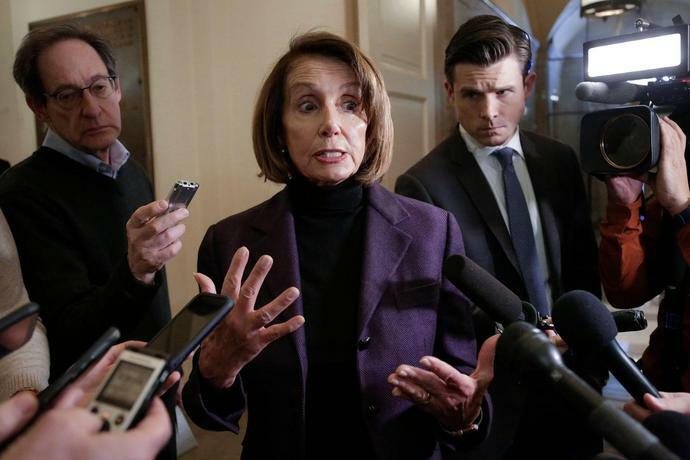 Dean Obeidallah, CNN: "Trump made a public offer on Saturday to House Speaker Nancy Pelosi and congressional Democrats. ... Pelosi swiftly rejected the offer as a 'non-starter,' and she was right to do so. From the right, the reception for Trump's offer was equally scathing. Pundit Ann Coulter slammed it almost immediately. ... While I don't usually care what Coulter says, when it comes to Trump's immigration policy, she and radio show host Rush Limbaugh might be the most influential voices. That's why if Pelosi wants to end this shutdown, she should start by speaking with Coulter and Limbaugh, not the president."